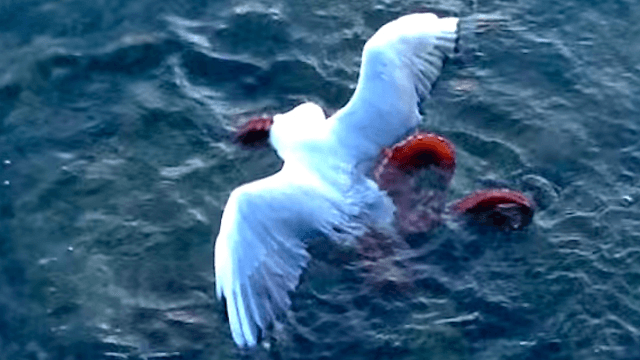 Octopus drags seagull down right in front of kids who were feeding it. Welcome to the beach. You may have known that octopuses can change colors better than chameleons, open locks, scare grown men, enact daring escapes from aquarium tanks, and even come onto land to hunt crabs—but did you know they can also murder seagulls? Right in front of kids? Listen, if you don't want to watch that, don't click on this video. Frankly, if you don't want to watch that, it's unclear how you got to this article, but as a last warning, this video contains exactly what has been advertised: a seagull being dragged down to its death in front of some kids on a dock. Here, this will make you feel better: Meet the brand-new tiny octopus that's named for how darn cute it is.